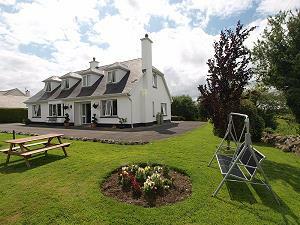 Welcome to the Glencove B&B Ennis, Co. Clare! Glencove BnB is located in quiet surroundings just 15 minutes drive from Shannon Airport and 5 minutes drive from Ennis town centre. It is only a short way from the Ennis bypass of the M18 and the N85 to the Cliffs of Moher. This central location is ideal for exploring the sights of County Clare including the Burren, the Cliffs of Moher and Bunratty Castle, all just a short drive away. Walkers & Cyclists have quiet country roads to choose from, the Mid Clare Walkway is passing the house. Golfers have a variety of Golf courses for all ambitions nearby. Irish Hospitality and professional service will accompany you during your stay in our house! Rest in the comfortable lounge after a day full of activities, enjoy your Irish or Continental breakfast in the stylish breakfast room or contemplate the day in the garden! The Guest Rooms are all ensuite and comfortably furnished to ensure a good nights rest. There are double, twin and rooms with double and single bed available.